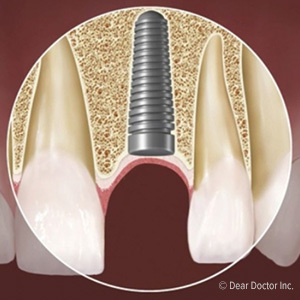 One of the best and most successful tooth replacement choices available is the dental implant. No other restorative method is as similar in both form and function to a real tooth as an implant; and with a success rate of 95-plus percent after ten years, it’s one of the most durable. But there can be extenuating circumstances that make obtaining an implant difficult or sometimes impossible. One possible problematic situation is the systemic disease diabetes. Diabetes is a hormonal condition in which the body is unable to sufficiently regulate the amount of glucose (a basic sugar that provides energy to the body’s cells) within the blood stream. Normally, the pancreas produces the hormone insulin to reduce excess glucose. But diabetes interferes with this insulin production: if you have Type 1 diabetes, the pancreas has stopped producing insulin altogether; if you have the more common Type 2, the body doesn’t produce adequate insulin or it doesn’t respond sufficiently to the insulin produced. Over time diabetes can affect other areas of health, especially wound healing. Because the condition gradually causes blood vessels to narrow and stiffen, the normal inflammatory response to disease or trauma can become prolonged. This in turn slows the rate of wound healing. Slow wound healing can have a bearing on the recovery period just after implant surgery, especially the necessary integration process that takes place between the bone and the titanium metal implant that provides its signature strength. If that process is impeded by slow wound healing caused by diabetes, the risk increases dramatically for implant failure. That’s the worst case scenario if you have diabetes, but only if your condition is out of control. If, however, you have your blood sugar levels well regulated through medication, diet and exercise, then your chances for implant success could easily be on par with someone without diabetes. So if you’re diabetic and are considering dental implants for missing teeth, it’s important to discuss the possibility of obtaining them with both your dentist and the physician caring for your diabetes. With your overall healthcare team working together, there’s no reason why diabetes should stop you from enjoying this premiere restoration for missing teeth.